So i've been experiencing this annoying problem for a while with my Onza Zoot which usually happens when i'm doing pedal kicks. Sometimes when I kick hard enough, rather than jumping forward there is a loud KLANG noise coming from the chain somewhere and afterwards my chain is slack. At first I thought it was something to do with the crappy chain tug bolts bending under load letting the wheel slip but i've just switched to some Gusset Kojak tugs I bought from Tarty after reading a recommendation on here and it's still doing it so it can't be that. It occured to me when it happened again the other day that it feels like it's happenning at the crank, when I put the power down maybe the crank slips but the chain doesn't move. Could that be happenning or is it something else? 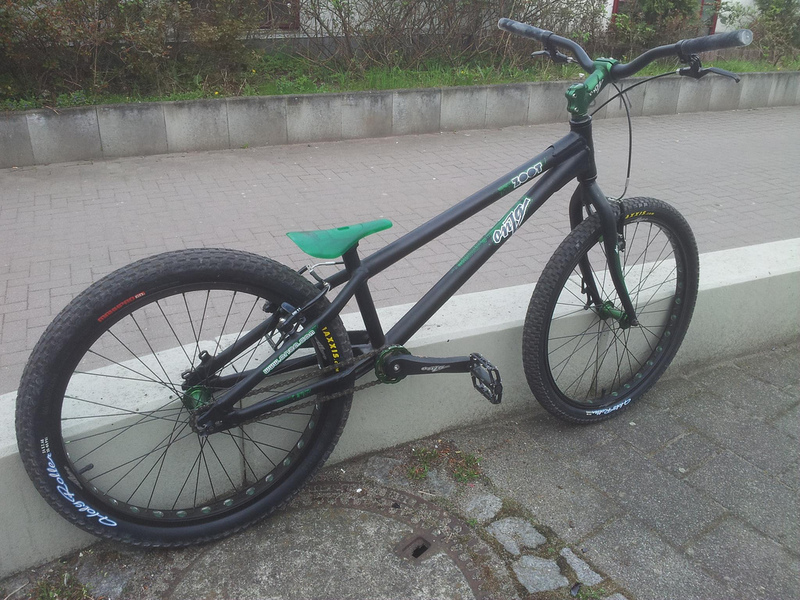 I don't know enough about the bike yet to understand what is happenning just from the way it feels. It's really annoying and doesn't give me any confidence in attempting moves at the moment. So what could it be and how do I fix it? Stick your phone against a wall and film the drivetrain as you jump on the front pedal. Then you should be able to see what is messing up, if not, post it on here and I’m sure someone will spot what’s up. Even if you think it is the freewheel it’s worth checking to avoid wasting money on parts you don’t need. With things like this, it's generally best to try and separate issues off so you know where to look. If the chain is tight, you hear this noise and then it's slack, the only cause of that will be the rear wheel. The position of your rear wheel is what dictates chain tension, so it's going to involve that. If the chain is still tight (or if it's only loose in spots - most freewheels don't spin perfectly concentrically around the BB axle, so you'll often get tight spots or loose spots. 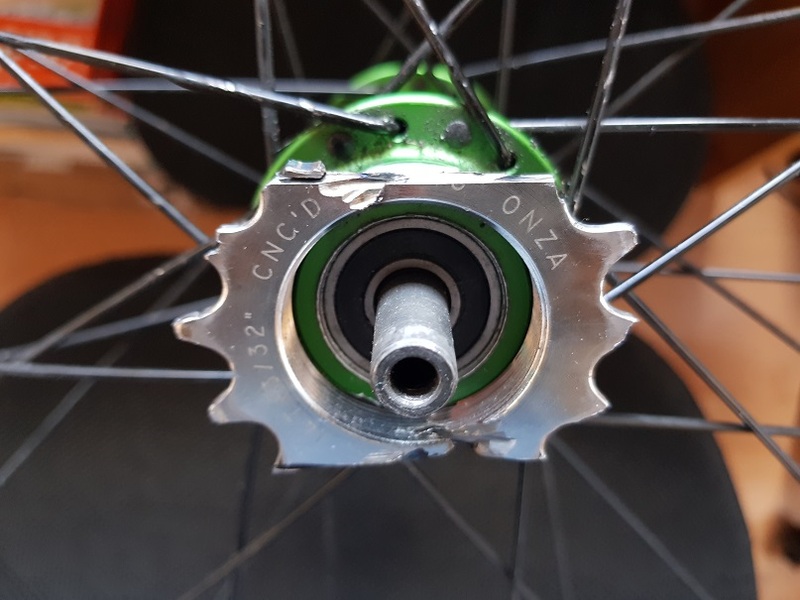 This is especially true with Onza cranks due to the design of the threaded section for the freewheel) then it sounds like it'll be your freewheel skipping. If the chain is going loose, then your best option is to take your back wheel out, take the axle bolts and washers off and give everything a good clean. If it's been slipping in the past you might have bits of paint and metal built up on the end of the hub spacers which will stop them gripping the frame as effectively. The big thing though is to make sure you've got plenty of grease in the axle threads and on your axle bolts. Dry bolts will often feel like they're torqued up quite a lot before they really are, so putting that bit of grease on will help you get a lot more torque through them which should hold them in place. If your old tugs broke, that will usually be from the wheel shifting, so it would suggest this is a likely cause. The wheel suddenly shifting can sometimes make a noise too, incidentally. For the freewheel, if you've got something like GT-85 you can flush the freewheel out to help perk it up a bit. 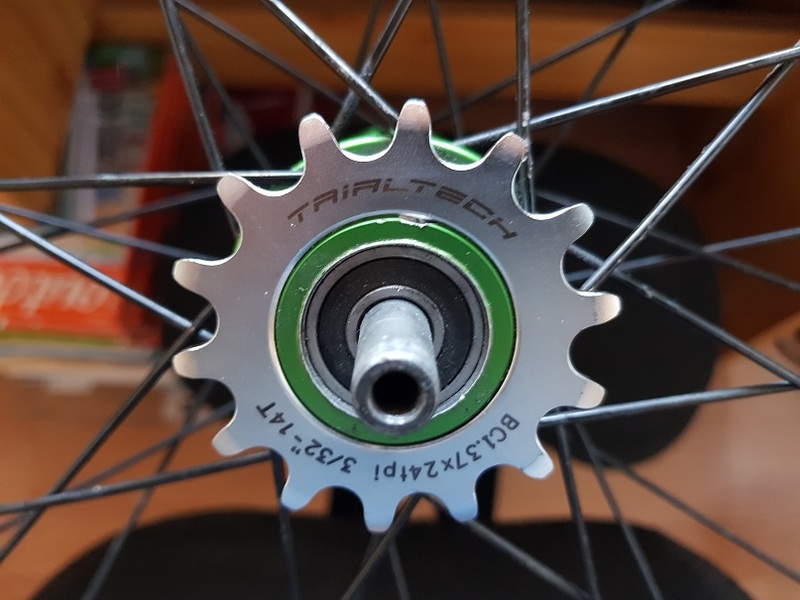 Just point the tip of the nozzle into the gap between the outer shell and the centre section of the freewheel (this will be easiest with the bike upside down, and you being on the non-drive side of the bike), and as you slowly rotate the cranks backwards start spraying into it. If you've got any dirt or similar in the freewheel this can help get some of it out. From memory, the Tensile freewheels on the Zoot come with some grease in them which will slow down engagement a bit too and make them more prone to skips (as well as being a magnet for dirt/grit) - the GT-85 will help reduce the 'stickiness' of that grease a bit as well. I've got an '09 or '10 Zoot, the black and green one. It lives at my Mother-in-laws house in Germany so I only ride it for a month every other year or so, but I've had the same problems. It's still got the stock freewheel, which feels fine. It does have a bit of precession, but no worse than I've seen in lots of other bikes. I switched to more burly chain tugs just like you, but it didn't fully solve the problem. What I've finally decided is it's the chain trying to climb over a tooth and then slamming back into the trough because the whole rear frame is flexing during a good pedal kick. I'm sure you could film it with a higher speed camera and see it, but I'm fairly certain that's what it really is. I love how light my Zoot is, but that weight comes at a price. Even the newer Zoot Pro frames were pretty lightly built. I plan on replacing my Zoot next trip to Germany. If you figure something else out, let me know too. Otherwise I'll pass my Zoot on to a kid. What I've finally decided is it's the chain trying to climb over a tooth and then slamming back into the trough because the whole rear frame is flexing during a good pedal kick. For the chain to move over a tooth like that (if I read you right) there'd have to be a lot of twisting/flex - you wouldn't need a high speed camera to see it. The Tensile freewheels aren't the best so if your chain tension isn't altering but you're just getting a skip then it's probably just the freewheel doing it's thing. If your chain tension is dropping, it can only be the wheel moving in the dropouts. The chain is deffinately slack after it happens as that's why I assumed it was something to do with the weak chain tugs to begin with cos I kept having to adjust them. The problem with the old tugs was that the threaded part and the washer section where the axle bolt passes through were 2 seperate pieces, the threads kept bending where they join the washer. However these new tugs are 1 piece but it's still happenning so I guess they wern't the root cause in that case. If I get time at the weekend i'll take the rear wheel off and have a look. The problem with the old tugs was that the threaded part and the washer section where the axle bolt passes through were 2 seperate pieces, the threads kept bending where they join the washer. However these new tugs are 1 piece but it's still happenning so I guess they wern't the root cause in that case. It's just something that happens with M6 axle bolts and horizontal dropouts. It's why for comp style bikes with snail cams most riders will go for notched snail cams as they are much harder to make shift or slip compared to chain tugs or smooth snail cams. As you suggested Mark the contact points of the hub spacers are pretty clogged up which can't help much with them gripping the frame. However whats more worrying is I seem to be missing 3 teeth from the sprocket! Don't know why I didn't check that before. So looks like I need to get a new rear sprocket. Any ideas how I get this one off and any suggestions on a good replacement? And the rest! I count 5 missing/very worn teeth! If you cut enough teeth off on both sides you can use a real wrench to get it off. I've tied the wheel to a street sign post to hold it steady before and then go at it with a wrench and breaker bar. Viel gluck! So just thought I would post a quick update on my rear sprocket troubles. Tried a number of things to try and get it of but it was so tightly jammed on there it just wouldn't budge. With no access to a bench vice, in the end I went with the suggestion from monkeyseemonkeydo and got someone handy with an angle grinder to go at it. Worked away at the metal on both sides a bit at a time until almost through to the thread. This freed it up enough to get it moving with a hammer. Was a bit worried about damaging the threads on the hub so I wouldn't recommend doing it this way but it came off pretty unscathed. Took delivery of my new Trialtech sprocket today which is a direct replacement and went on without any trouble. Haven't had a chance to get out for a ride yet but i'm pretty confident this should solve the problems I was having. Just wanted to say thanks for all the help getting this problem sorted! Soooooo another update. Went out for a ride the other day and the problem remains In fact it seems to have gotten worse! The chain coming slack doesn't seem to be happenning anymore but the loud bang when doing pedal kicks and the skipping seems to be happenning more frequently now. I actually think it may have been 2 separate problems, the chain coming loose was down to the rear wheel and the sprocket which seems to have been rectified, but I think the skipping and noise it makes is a problem with the FFW. I've been reading more about the stock Zoot freewheels and this also seems to be quite a common problem. When I rotate the crank backwards it also feels like something is grinding as I can feel some resistance. Any ideas what I can try next? Should I remove and strip down the freewheel and see what it looks like? Any guides anywhere on how to do this for an FFW? I'd just buy a new freewheel at this point, save a lot of time and effort. You could spray some WD40 in the freewheel, lean it over and spin it. See how much crap drains out and just keep going until its coming out clean. I used to do this with freewheels and then put some wet lube or a thin grease in it to keep it going. Don't forget a new chain too. If you're using your old chain it might not be marrying up with your new cog. So I finally got round to having a look at my freewheel. Ended up removing the crank from the bike and removing the lockring. Was pretty messy inside to I took the whole thing apart and soaked everything in wd40 to get rid of all the small bits of metal and other crap. Once it was all cleaned up I could see that a number of the engagement points on the cog have been quite well worn down so I tried to restore the worst ones using a file to regain some surface area. Regreased the bearings and put the whole thing back together. Went for a ride and I think it is actually worse now than it was before so it seems like all that effort was a lost cause. I guess my only option now is to replace the thing. Does anyone know the exact model of the stock freewheel on the Zoot? It's made by Tensile but other than that I don't have much to go on. 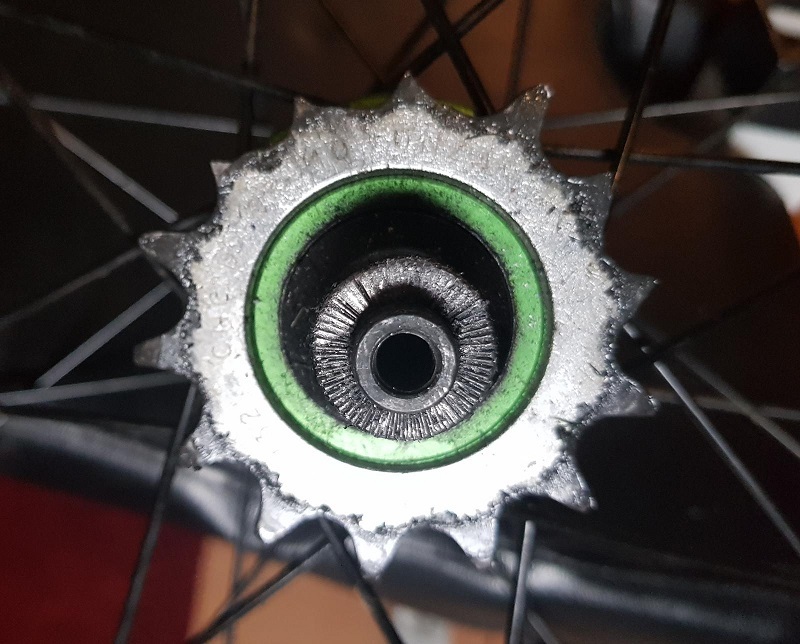 Is it possible to buy replacement parts for freewheels as it's really just the cog with the engagement points that needs replacing I think? Or can anyone recommend a low cost replacement that would be a direct swap?